It might not be the capital of Australia, but Sydney is certainly the most fun and popular city Down Under. We all know what an excellent city Sydney is, and it’s the beating heart of New South Wales. There are so many great things you can do here, and it’s a city bustling with excitement, adventure, and wild abandon. If you plan one trip to ‘Stralia in your life, make sure you visit Sydney. What we love about Sydney is that, in a lot of ways, it’s kind of like Australia’s equivalent of New York City, except that you have the added bonus of beaches as well. With over 4 million residents and 32 million tourists per year, there’s clearly a lot to keep people entertained here. So, let’s look at some of the most amazing things in Sydney; things that will make it an unforgettable trip. Yes! This is the staple of any trip abroad. We love a walking tour because you get a more local perspective, and you’ll find out things you never knew before. Seeing the city from a different perspective is really important, and the best part about it is that it’s free. Check out the “I’m Free” walking tours of the city. 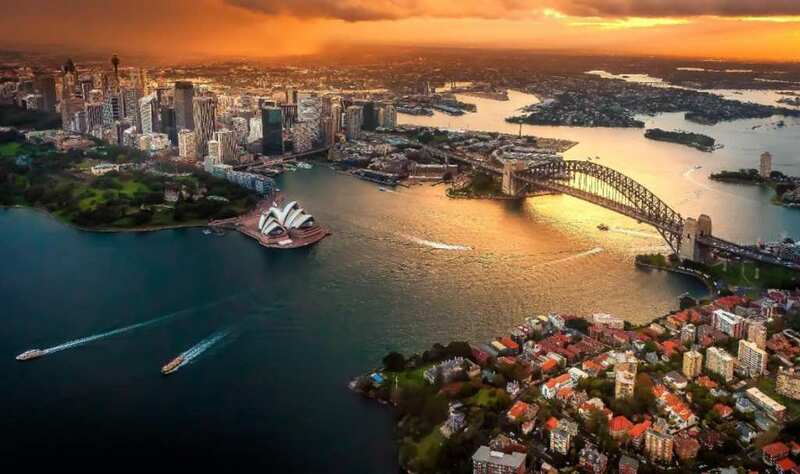 This is a good way of making sure you get the true Aussie touch, and that you get a beginners guide to Sydney, along with all the great aspects of it. It’s also an excellent way of getting plenty of sightseeing done all in one go. The world famous Bondi Beach is a tourist haven in Sydney, and one of the places you definitely need to go. Yes, it will be busy, almost any time of day you go, but the atmosphere is electric. It’s the kind of place we would recommend you go to simply so you can say you’ve been. The beach is also on the Australian Heritage List, and is a stunning, picturesque, and social part of your journey through Sydney – we definitely suggest you check it out. Yeah, you heard us right! This bridge is one of the most attractive and stunning in the world, and, at night, it looks beautiful all lit up. It’s also one of the few climbable bridges in the world, so come on, what’s the holdup?! Of course, there will be plenty of health and safety to go through, and you will have professional guidance, so you can just focus on enjoying the stunning view! This is a unique way to experience this great bridge and to see the city of Sydney. Sydney Opera House is one of the most recognizable buildings in the world and a true cultural landmark of Sydney. There are so many wonderful things to see in the city, but this one has got to be up there. As one of the memorable things to do here, you should take in a show in this famous Opera House. This stunning UNESCO World Heritage site is breathtaking at night once it’s illuminated, and a true treat for anyone visiting Sydney for the first time. Sydney is one of the leading cities in the world, and you have to make sure you experience all it has to offer. That’s why you need to have as many fun, and amazing experiences as possible, and these are some of them. We hope our list will have inspired you to discover a better and more memorable side of Sydney.